Homemade gifts are always the best! 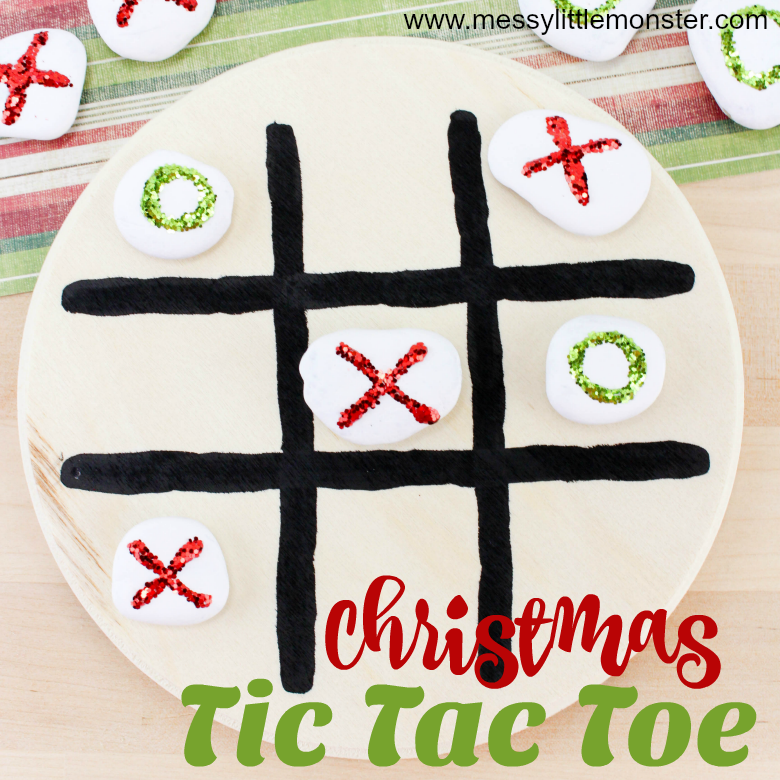 Why not made a Christmas Tic Tac Toe game or two as homemade gifts for kids this Christmas! 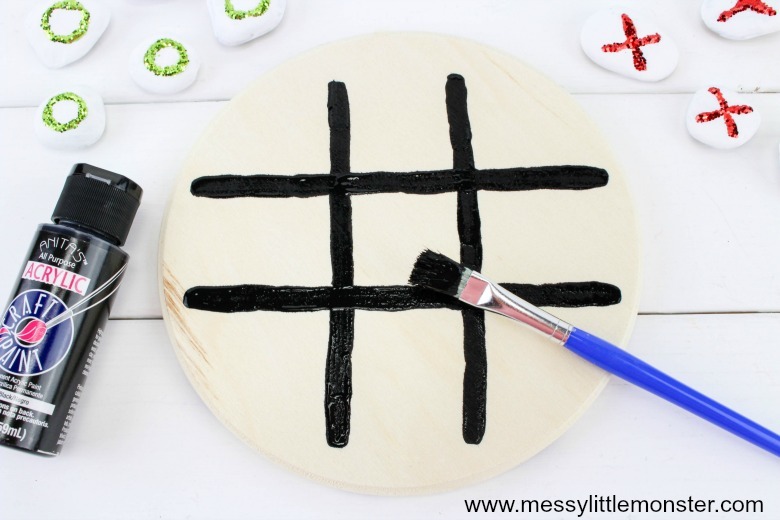 The kids will love having some family Christmas games to play over the festive period and making a DIY Tic Tac Toe game won't take long at all. Below we share the easy step by step directions to make this fun homemade game. 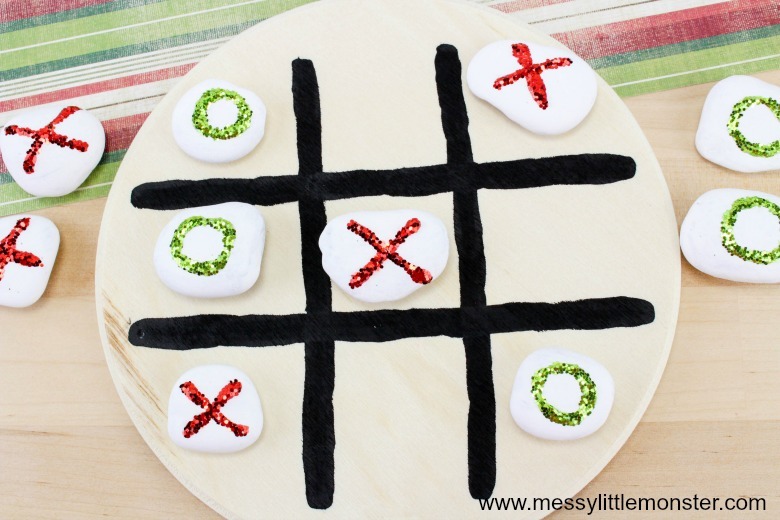 Tic Tac Toe will be enjoyed by kids young and old! We have recently made another version of this game using found pieces of nature. Check out our nature Tic Tac Toe made from a wood slice and conkers! We love homemade gifts. 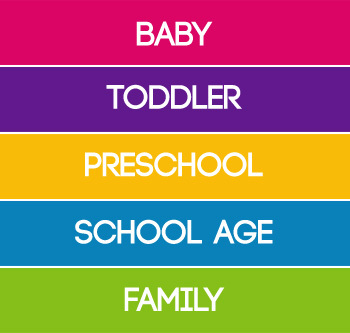 Take a look at our collection of gifts kids can make. 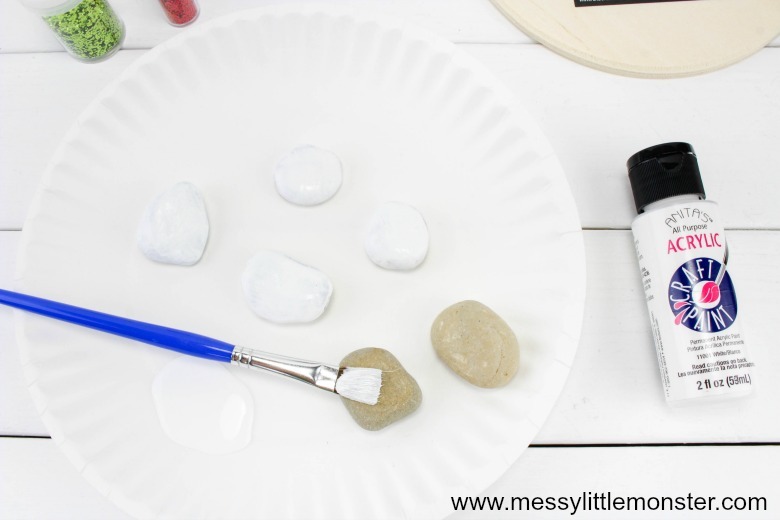 To prepare your rocks paint them using white acrylic paint. You will need a total of 10 rocks for this Tic Tac Toe game. Leave the painted rocks to dry. Take your clear glue and on 5 rocks draw a glue circle. Sprinkle the green glitter all over the glue. Tap off the excess glitter and let dry. 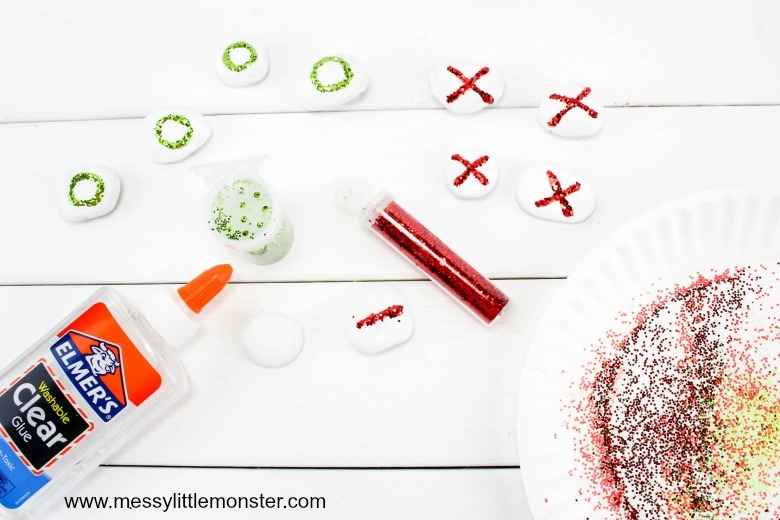 On the other 5 rocks, you’ll make an X and sprinkle with the red glitter. (The X may come out better if you make one line at a time and let dry for a few minutes in between so the glue doesn’t run together). Again tap of the excess glittter and let dry. 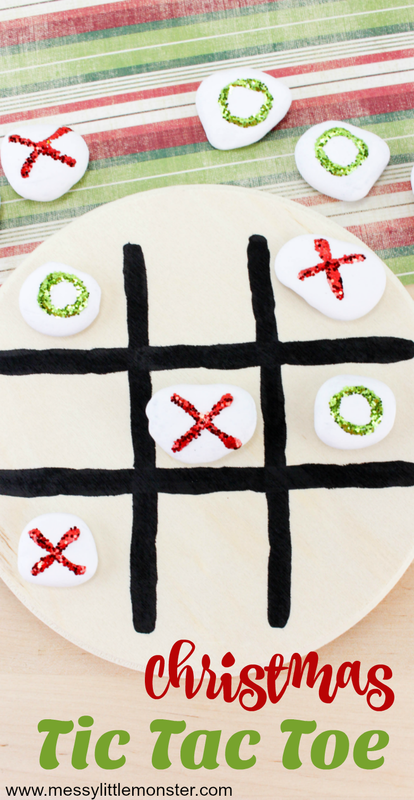 Once everything is dried your Tic Tac Toe game is ready to be played. Take it in turns to add naughts and crosses to the grid. The first to complete a row of 3 is the winner! 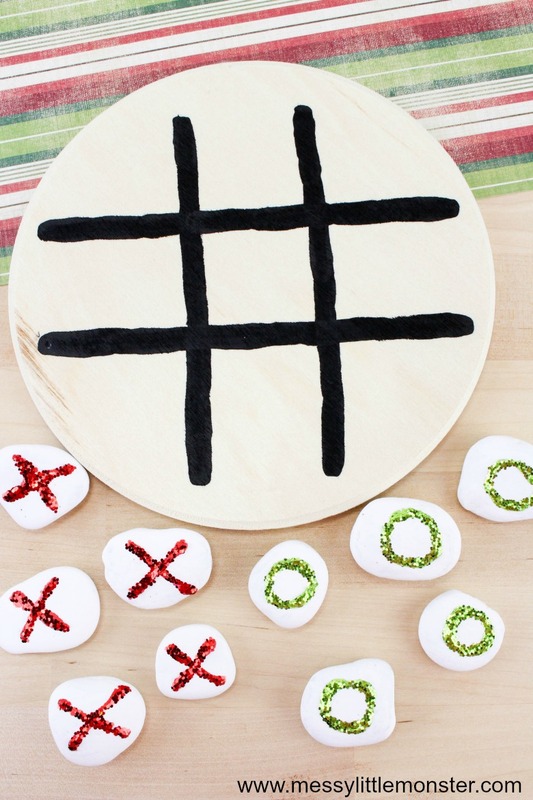 These Tic Tac Toe games make great homemade gifts for kids and adults alike! 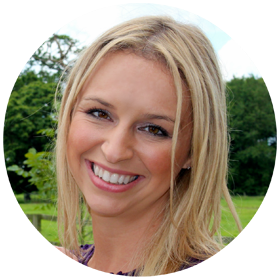 Family Christmas games like this are so much fun to play over the festive period.